Escaro Royale is bringing sophistication and luxury to menswear. This brand is all about exclusively curated shoes, bags and accessories that are created using best of material and designs. A fine man needs perfection in his closet and Escaro Royale offers just that with leather shoes, beautiful canvas bags, belts and even cufflinks. But what shines the most is their epic customer service. They believe in an open communication with their customers to provide custom products. These products are hand finished, hand painted and handcrafted according to your requirements. #LBBProTip: Try their open delivery system. A delivery guy will visit with multiple sizes. He makes sure that you try it on. So basically, you pay only when you really love it. The service is currently available in Delhi and coming soon to Mumbai & Bangalore! The brand launches a new collection every three months to keep up with the changing taste and style of its customers. This is their way of providing something new every time and being able to cater to all kinds of people. What sets Escaro Royale apart is its material selection, merchandise and quality control. So when you buy something you know that you are getting what you asked for. 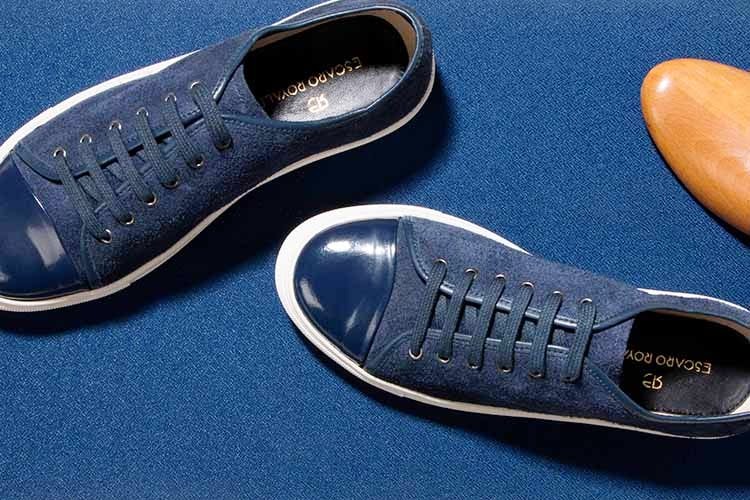 We recommend the low-top leather sneakers available in various colours including black. The blue oxfords are a beauty. We are in love with the colourful Venetian canvas bag that looks like a painting. You should also try the silver-plated cufflinks for some elegance and a dual-tone leather wallet for some edge. It is very difficult to pick just one thing from this brand. But you can visit the website to find out your favourites. Escaro Royale is on its way to become India’s largest luxury and premium brand for men. They are all about opulence, supreme quality and a royale experience. This is one brand you need to own asap! Follow them on Facebook, Twitter & Instagram to keep up with their new collections.